Here are some of the Best Books for the Old House Owner that I personally recommend. This site is like an on-line version of an 1890 Sears Rebuke Catalogue featuring tons of reproduction items. The National Trust for Historic Preservation has a page for advocacy of preservation. Here you can send form letters in support of historic preservation legislation. To sign up for e-mail delivery, visit the National Trust for Historic Preservation Advocacy Center . 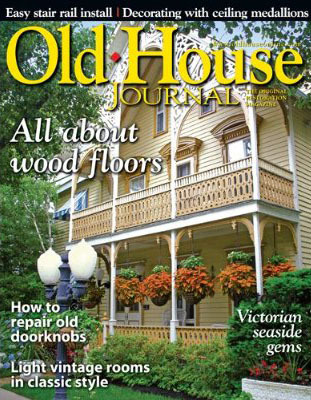 The Old House Journal is a magazine which has a web site. There is no other magazine that can compare to the wealth of information provided. Otherwise known as Old House Online. This forum is about Old House Restoration and Repair Advice. This site is the authoritative source for old house restoration and repair. Features extensive How-To’s, Product Directories and User Forums. A forum with a group of long time restoration enthusiasts and old home owners to help with any old home advise you need. The name is just what it says. You can find a link for anything you need to know at this site. Highly Recommended! Here is a new site – a community discussion forum for home improvement and repairs. Although not geared to historic homes, it is a resource for general house repair questions. A great resource. Helping owners, tradespeople, contractors and professionals understand and maintain their historic and older buildings. Architectural elements for your home. A curated, online historic house marketplace that showcases the most beautiful old homes for sale all across the country. Architectural metalwork care and guides. These guides help the homeowner understand and care for historic metalwork. Scott Slider knows and works on restoring old houses. He has a great blog with very informative articles that every old homeowner should know. Need your windows repaired or restored. How about a carpenter with historic house specialization. We have a listing by Country – State. These people specialize in Windows but they may also do other restoration work. If not maybe they can refer you to someone else. Click here for our listing of historic house craftsman . If you’re stuck finding someone. Contact your State Historic Preservation Office . They have a listing of qualified Architects. Contact one of them and ask for a referral. This is my best advise. Don’t waste your time anywhere else. This is an excellent resource. SEARS & ROEBUCK KIT houses are are pictured in this web-site. Each house is pictured with floor plans and some interior views from 1908 through 1940. Go to the archives section and choose Kit Houses. There are also many other excellent resources in this site. Another site dedicated to the preservation of Bungalows. The National Park Service – Department of Interior provides a Technical Preservation Service. Writers working under contract with the federal government have assembled more than 40 booklets designed to help homeowners and developers recognize and resolve common preservation and repair problems. A must read! Before you start a project, you should first refer to these bulletins. Click here. Highly recommended. This Library of Congress resource has put online the HABS – Historic American Building Surveys which were done as a government project in the 1930’s. Architectural drawings from historic buildings are available in hard copy which can provide a wealth of knowledge. For example: what kind of door knobs were used in New England in 1842. This site takes some playing around with. America’s #1 source for restoring antique and vintage stoves and refrigerators from the 20’s to the 60’s. Do NOT go to their web site, read their magazine, or watch their TV show. This Old House is very well known and has great media exposure. Therefore it has a great influence on the public and this is dangerous. Their media can be considered educational or a learning tool to those eager to do projects on their home. UNFORTUNATELY, their message does NOT teach or promote the preservation of the historical character of one’s home. Instead they create a desire to be creative, make changes and destroy. If your lifestyle doesn’t fit your house, you should find one that does or build a new home based on historic plans. Knocking out walls, turning grand staircases around and gutting kitchens is not what old house lovers do. Your house represents history and you should respect that for future generations. With the influence This Old House has on the public, I fear for the future of old homes. Once it’s destroyed, it’s too late and it won’t be long before the only place you will see an authentic kitchen etc. is in a book.